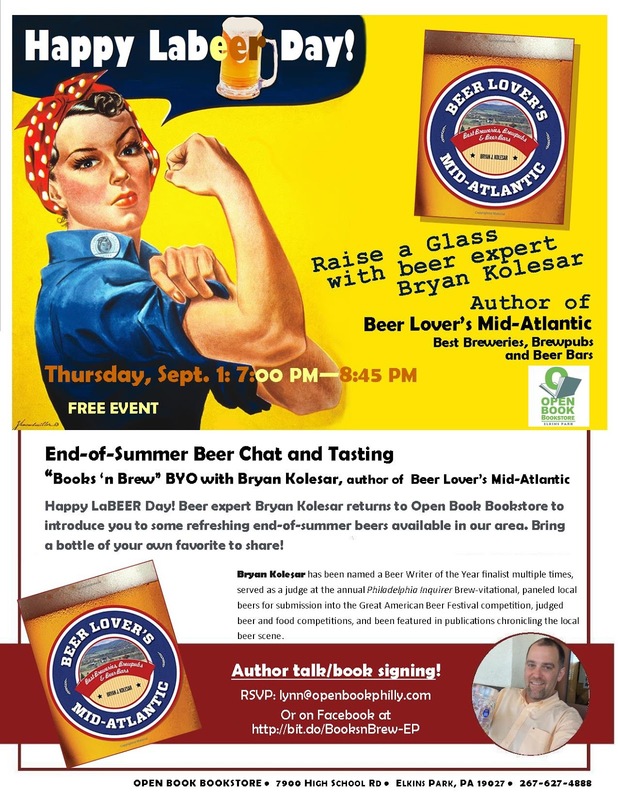 It's now been over two years since I finalized the first draft of my book - Beer Lover's Mid-Atlantic - for submission to the editors at the publishing house. And fifteen months since it was released. Very hard to believe how long it's been. In the intervening months, I've had 56 appearances at book signing events in bookstores, bike shops, Beer Weeks, markets, festivals, breweries, and bars from Pittsburgh to Baltimore to Philly and small towns in between. 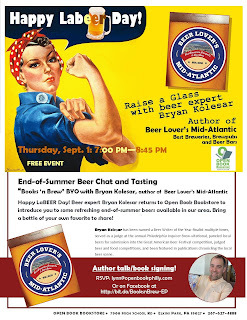 And while I'm certainly not pushing the book as hard as I had in the first year of its release, I'm looking at a few events in the next couple of months around the Philly/South Jersey area. Next week, first up is a return visit to Open Book Bookstore in Elkins Park, Pa. This was the site of a very successful "after-hours" tasting, talking, and signing where a few dozen or so beer fans came out for the book and a beer tasting. On Thursday, September 1, join me and the staff at Open Book. I'll bring some bottles/growlers of beer; you feel free to do the same. Oh, and as a bit of BTW, one of my unabashed points of pride in the book project was the due diligence that I put into vetting the establishments to be included in the book. It was never set out to be an all-encompassing directory of every beer and brewing establishment. Rather, the more significant and interesting ones in PA, NJ, MD, and DE. The original list of roughly 500 places was whittled down to 379 in-person visits and just shy of 320 were ultimately included in the book. I bring this up because book's of a nature like mine (i.e. guidebook-ish) can tend to be viewed as outdated after a period of time. But, after nearly two years since finalizing the manuscript (and in the spirit of full disclosure), the following is a list of closed establishments that were included in the book. - Twin Lakes (chapter 1; Northern Delaware) - Open. Maybe? Doing (have done?) decent stuff. Then some drama on the Dupont Farm Property leaves Twin Lakes closed and without a home. Reportedly are back up and running in Newport, Del. I need to follow-up on this. - Always Ron's (chapter 4; Other Maryland) - Very popular place doing great stuff as a proponent of "better beer" and they were also a "Raven's Nest". But, after ten years, ultimately sounds like it came down to the owners being ready to just go off and do something different. - Baying Hound (chapter 4; Other Maryland) - Even though I didn't have a 100% warm-and-fuzzy about them, their trajectory seemed strong enough and in the right direction that I was a bit surprised by the closure announcement. Sounded like a "time-to-get-out-of-it" decision sort of like Boaks in northern New Jersey - on the other hand, one that I did have a gut feeling would eventually run out of steam. - Gamble Mill (chapter 8; Central Pennsylvania) - They've been looking to sell as a turn key brewing establishment, but that time might be running short. Sounds like the locals were fans and disappointed to see them go. Such a beautiful historic property so I'm surprised a deal hasn't been done yet. But that's me on the outside looking in. - Barren Hill (chapter 9; Philadelphia suburbs) - Unfortunately, the collateral damage of a divorce. Apparently has been sold and a new brewing establishment is set to take over the property in 2017. - 34 East (chapter 9; Philadelphia suburbs) - This was just a short blurb included in the "Ambler Pub Crawl". Didn't have any real attachment to the place, but if any of the places on the list for Ambler could have been dropped without regret, it would have been this one. - Nodding Head (chapter 10; Philadelphia) - I included them if for no other reason than the role they, and owner Curt Decker, have played over more than 15 years even though I knew they were closing/relocating. Question is: are they still reopening? Thanks to Philly Brewing, you can still find select Nodding Head brews around town. Finally, I'm very happy to report the following that are included in my book that since experienced setbacks and challenges have recovered. - Quarry House Tavern (chapter 4; Other Maryland) - The wonderful subterranean dive bar was a victim of flooding from a fire in the upstairs Indian restaurant in March 2015. They've been operating a temporary "pop-up" type of QHT across the street since then and have had great support from their industry brethren and consumers alike. I need a local confirmation of their reopening status in the original location. - Blue Canoe (chapter 7; Western PA) - Another devastating fire in an adjoining property, this one also in March 2015. Took a while to re-open a year later in March 2016, but along the way, experienced the tremendous support from their fellow brewers in the NW PA brewing scene. In a future posting, I'll look at some forward-looking statements that were made about brewery expansions, openings, etc and see how they panned out. We'll see which ones I concluded were legitimate enough to include and which ones I more/less got snookered into including.